Fire and Smoke control is a particularly challenging aspect of buildings and environmental control and can mean the difference between life and death (as well as between legal compliance and non-compliance). 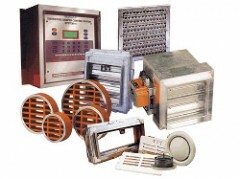 Alan Williams & Co products meet BISRA test standards and CPC conformity relevant to fire rating standards. Selecting Fire and Safety products can be daunting. Alan Williams & Co can offer advice on product selection, application and installation with the extra benefit of the additional and combined knowledge of our distribution partners.